is now available for purchase as a paperback! Edith Bouvier Beale and her daughter Edie, known as Big Edie and Little Edie, were the aunt and cousin of former U.S. First Lady Jacqueline Bouvier Kennedy Onassis. They led an unconventional existence in Grey Gardens, a mansion in East Hampton. Their home was surrounded by overgrown gardens, and filled with fleas, cats, raccoons, and old cans and rubbish. 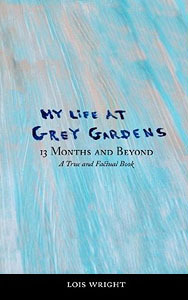 In 1976, the release of the documentary film also called Grey Gardens highlighted their unique lives among the East Hampton elite, and introduced the Beales to their cult fan following. In 1975, Lois Wright, a fellow artist and dear friend of the Beales, was invited to live with them in Grey Gardens. Wright kept a journal of her thirteen months with the Beales, and using those logs, has developed this book. My Life at Grey Gardens offers the reader an intimate look at the daily lives of the Beales, and chronicles the events from Lois's arrival at the house through the passing of Big Edith Bouvier Beale in 1977. This book was written in 1978, and published as an eBook in 2006, and a print-on-demand paperback in 2007. It was not published in 1978. Lois's manuscript is now available as a printed paperback book available at Amazon.com. Click here to purchase it! The book is still available as an eBook (electronic book) at Powells.com. Click here to purchase the eBook! Note that you will need to download and install the Adobe Acrobat Reader in order to read the book. If you need any help at all, please visit Powell's Books' Help with eBooks.